The GNOME 3.26 release cycle is in its final bugfix stage before release. Here’s a look at what’s new in GNOME Tweaks since my last post. I’ve heard people say that GNOME likes to remove stuff. If that were true, how would there be anything left in GNOME? But maybe it’s partially true. And maybe it’s possible for removals to be a good thing? The Power page in Tweaks 3.25.91 looks a bit empty. 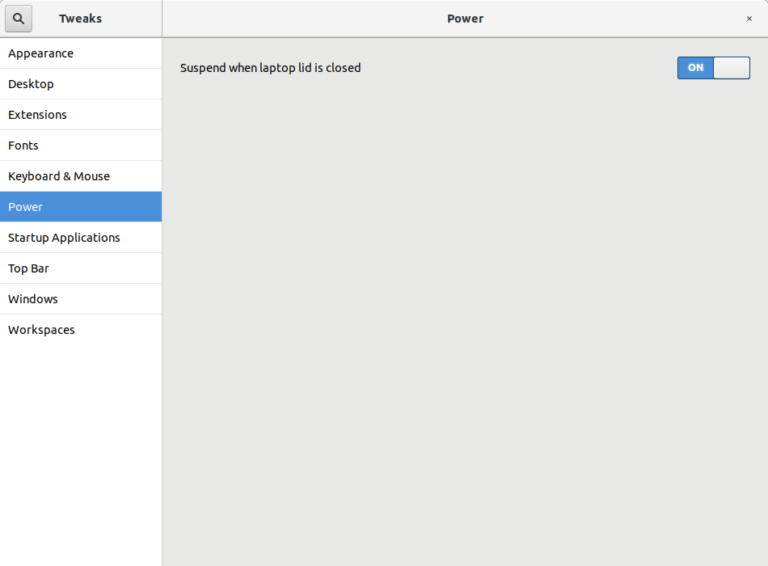 In previous releases, the Tweaks app had a “When the Power button is pressed” setting that nearly duplicated the similar setting in the Settings app (gnome-control-center). I worked to restore support for “Power Off” as one of its options. Since this is now in Settings 3.25.91, there’s no need for it to be in Tweaks any more. GNOME Tweaks offered a basic control to scale windows 2x for Hi-DPI displays. More advanced support is now in the Settings app. I suspect that fractional scaling won’t be supported in GNOME 3.26 but it’s something to look forward to in GNOME 3.28! Changing the Global Dark Theme option required closing any currently running apps and reopening them to get the correct theme. Some themes never supported a Dark variant. The switch wouldn’t do anything at all with a theme like that. Adwaita now has a separate Adwaita Dark theme. Arc has 2 different dark variations. Therefore, if you are a theme developer, you have about 6-7 months to offer a dark version of your theme. The dark version can be distributed the same way as your regular version. In case you haven’t noticed, GNOME Tweak Tool is now GNOME Tweaks. This better matches the GNOME app naming style. Thanks Alberto Fanjul for this improvement! For other details of what’s changed including a helpful scrollbar fix from António Fernandes, see the NEWS file. How does this dark theme change affect different software’s ability to request a dark theme variant? Software like Builder has a “Dark Mode” switch. Can software still set “gtk-application-prefer-dark-theme” to 1 to get a dark variant? Developers can still opt individual apps in to Dark Mode. That’s not affected by this change. What effect will that have if it’s a separate theme? Are theme developers expected to develop a light theme with dark variant as well as a dark theme? I didn’t expect my 1-line patch to be blog-worthy, thank for the courtesy Jeremy! I’m glad it allowed your work on redesigning window focus options to make it in just in time for UI Freeze. Fixing a 4-year old bug is a big deal! I really appreciated your help. You’re doing an absolutely great job as the maintainer of GNOME Tweaks. Keep up the good work!!! Would it be possible to leave text scaling in until fractal scaling lands in the next release or will the new settings app have text scaling setting? The Fonts Scaling Factor is still in Tweaks 3.25/3.26. The removed tweak is “Window Scaling”. Sorry I wasn’t more clear. I’m thinking now, what about a new feature like red-shift for themes? I don’t like much redshift because of my screen is annoyingly red. So, the idea is to set up schedules to switch from light/dark theme versions. What do you think? I miss in the Power section the possible to tweak the inactive mode and time. as always gnome gets worse and worse. “Removal #3 Global Dark Theme” !!! why would anyone in his/her right mind do that? !!!!!!!!!!!!!! with canonical abandoning of unity, I think the only option is to switch to windows. long live WSL. This is going to be troublesome as it throws the problem over the fence to every single viewport-using GTK application to reimplement. What would be your recommendations for GTK applications to be able to detect whether they are subjected to a dark theme or not? I don’t work on themes so I don’t think I will be able to help much here. But like I mentioned in my post, the popular Arc theme has 3 variants: which of them do you consider to be “dark”? Perhaps this is part of why the GNOME Developers have refused to include a theme chooser in the GNOME Settings app. This is kind of why GTK’s Adwaita existed: so that application writers could stop worrying all the time about how their app would render on someone else’s computer… the dark mode switch/property/signal had that advantage of representing only two variants that app writers could take into account. No, the GTK+ API was for an app to say that it wants to opt into a dark theme variant if the theme provided that. For instance, Adwaita is a light theme but the GNOME Photos app use that API and the app shows up as dark with Adwaita. Because of an implementation detail, that same API was used to provide the Global Dark Theme feature of GNOME Tweaks. That was not intended by the GTK+ API and it has several issues being used that way (mentioned in my post). That API does not tell the app whether the theme is dark or not. For instance, the default official Ubuntu theme Ambiance has never supported a dark variant. I suggest you talk to the GTK+ developers about the API you think is missing. I read that eventually the Tweak Tool (aka. Tweaks) will be merged with Settings. Is that still the plan? If so, when can we expect that to happen? Firstly, thanks for all the wonderful work you guys do! I’m concerned about a regression in removing the ability to toggle global dark variant. I use a global dark theme for A11y reasons. The problem is that some applications, like web browsers, render things like input elements in the dark form when a dark theme is used. Firefox have been kind enough to implement two settings so you can set dark variant for the UI and canvas separately. Having to switch to a pure dark theme would mean the web would be broken again. Would the GNOME Foundation be open to me submitting a patch to have the toggle introduced in the accessibility settings instead? Could you file a detailed bug with a specific test case? I’m ok with you filing it against GNOME Tweaks for now even though Tweaks may not be the place to handle this. If you can attach screenshots, that can make the bug easier to understand too. Thanks!